This tutorial aims to help you install the required environment, code your first smart contract and deploy it to RSK network. If you find something unclear, or have ideas on how to improve this or new tutorials? Found this useful? Want to help building more tutorials? Have ideas?, feel free to contact me! This is very hard to standardize, there are several tools available, and more are coming every day, lot of compatibility issues, versions, different OSs, so, I will try to give (IMHO) the most easy to install and compatible environment I can. RSK has two networks, one is a development or test network (also known as testnet) and a production ready network (the mainnet). To interact with the network, you must connect your application with a Node. You can find how to deploy a node and connect it to testnet or mainnet. New! no installation or hardware required. The Testnet has a faucet that provides SBTC to run your Smart Contracts within the sandbox for free, the Mainnet does not, that would be like giving money for free in the real world . You will need to install all the required software specified in the previous section. Let’s start coding! 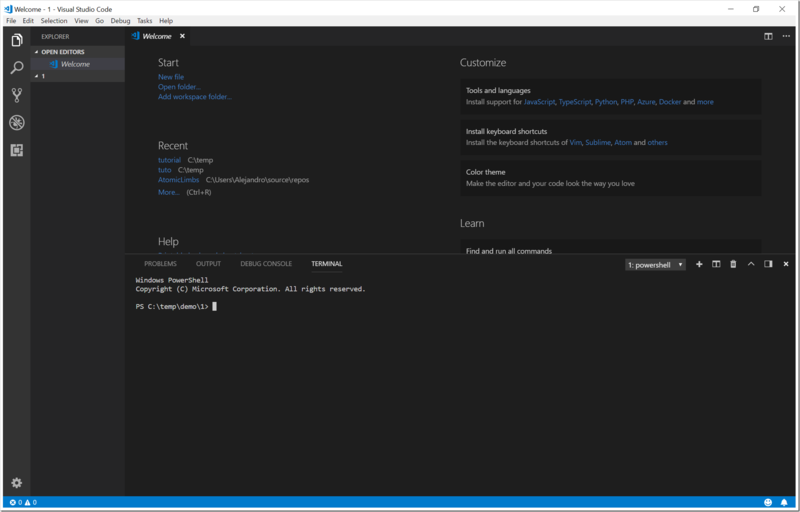 Open Visual Studio Code. You can see the interface in the screenshot. The first task is setting the environment folder. Its just a new empty folder that we are gonna use to host all our project files. Click on “File” –> “Open folder…” and choose a convenient location. As we are going to use the Command Line Interface that is not showed by default. 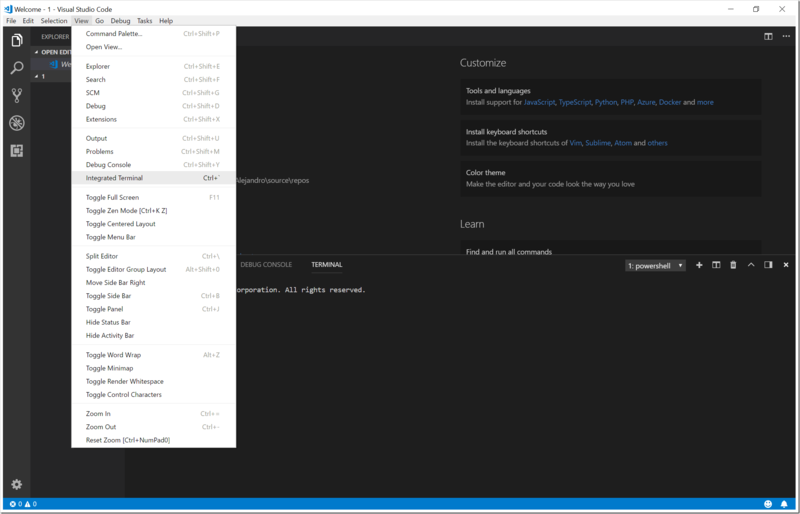 Click in “View” –> “Integrated Terminal” to open it. The folder should be empty in order to start fresh. 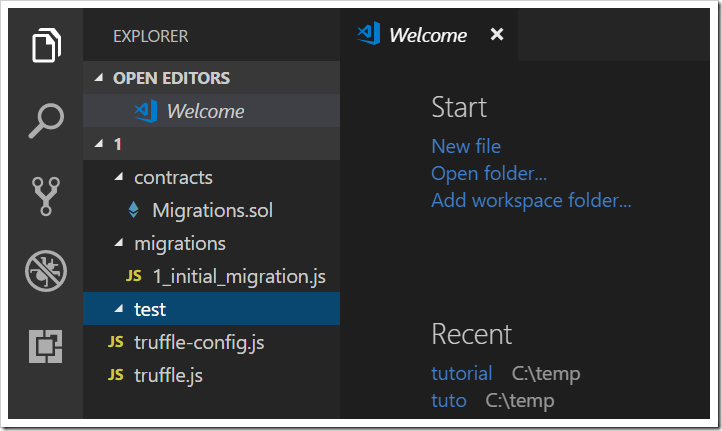 To start coding, truffle help us by creating a template project with some magic on it. This creates some folders and files as a template, we will focus our attention in. “contracts” folder: where our contracts must be (*.sol files). 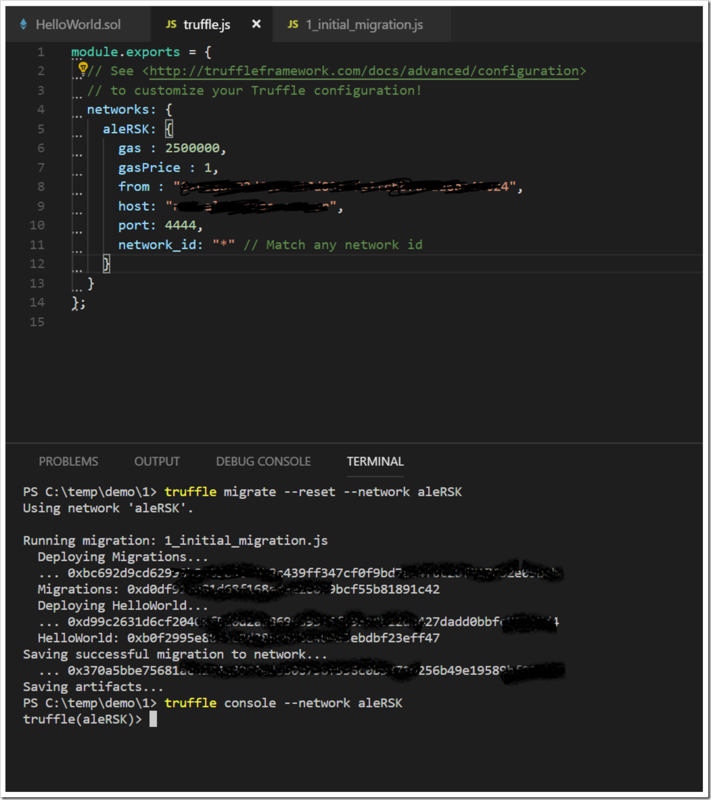 “truffle.js” file: truffle configuration file, we are going to configure our network to deploy the contract. 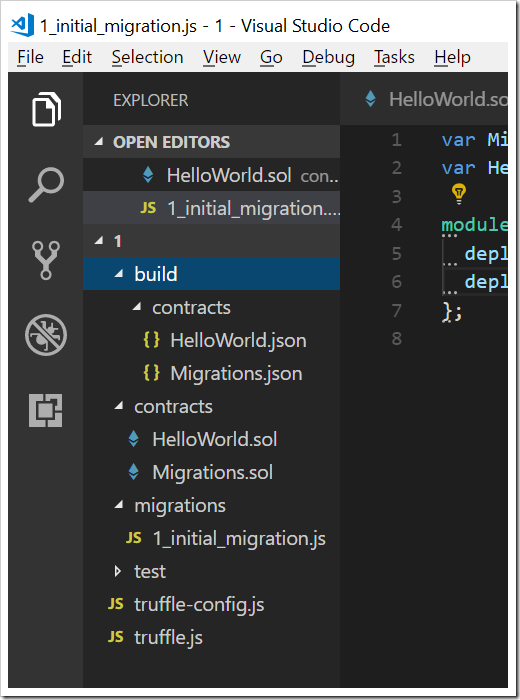 Lets create our first Smart Contract just creating a new file called “HelloWorld.sol” inside the “contracts” folder. 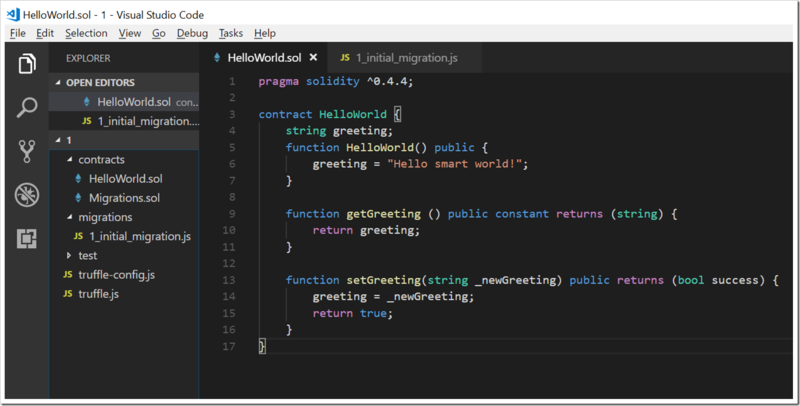 Its a simple Smart Contract with only one variable that can be asked or replaced using the functions “getGreeting()” and “setGreeting(“some message”)” respectively. Now we have our code done, let’s prepare the project to compile and deploy it. This tells truffle how to deploy our code. This operation compiles the Smart Contracts and creates one JSON file for each one. 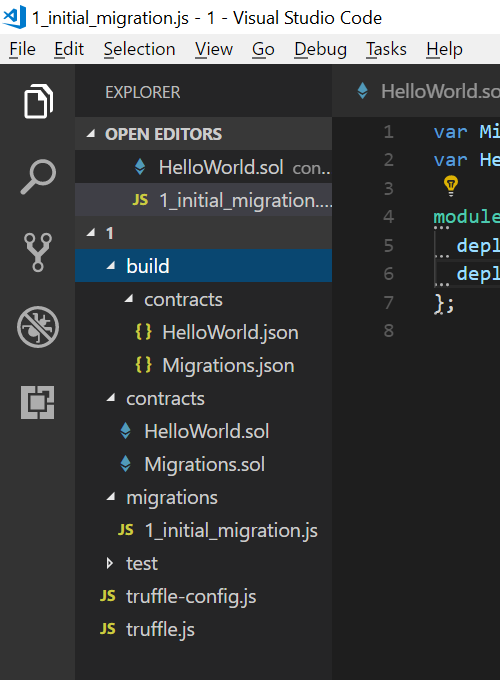 Open and see what’s inside our compiled Smart Contract (“HelloWorld.json” inside the new created “build/contracts” folder). Do you find some things interesting? 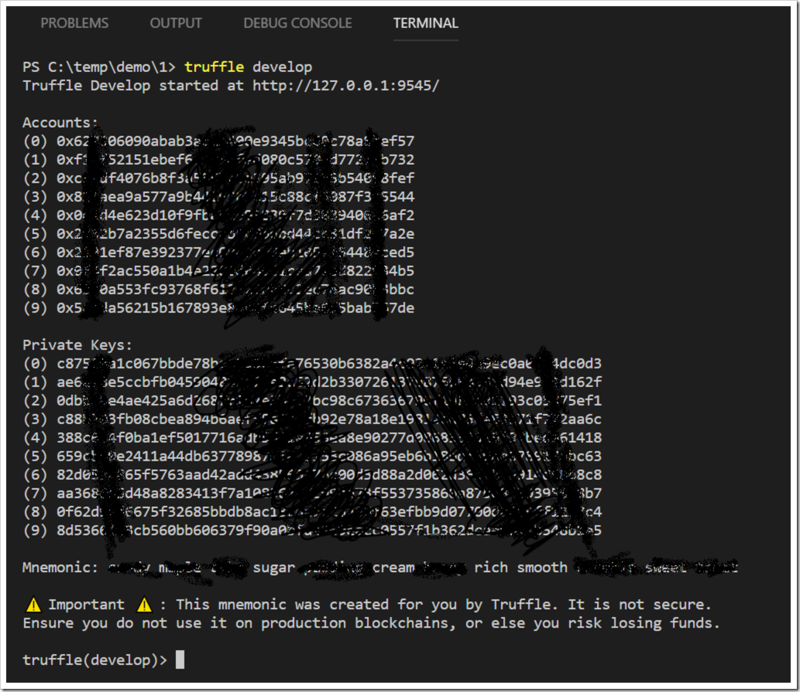 In order to avoid gas usage and long waits during our development process, truffle implements an in-memory blockchain that allow us to deploy and interact with our smart contracts. This command returns lot of information. Some to highlight are the address:port where the blockchain is running (http://127.0.0.1:9545 in my case, this may vary, but don’t panic). We can see also 10 account addresses with the corresponding Private Keys and the famous 12 words; Its convenient to write this down for future usage. Don’t send any money to this accounts, they are living just in your in-memory blockchain. Firstly, we are going to deploy our compiled Smart Contracts to our in-memory blockchain. If you started this tutorial from this step, I recommend to go back one and open the in-memory blockchain console. That is all! You have your Smart Contract deployed! 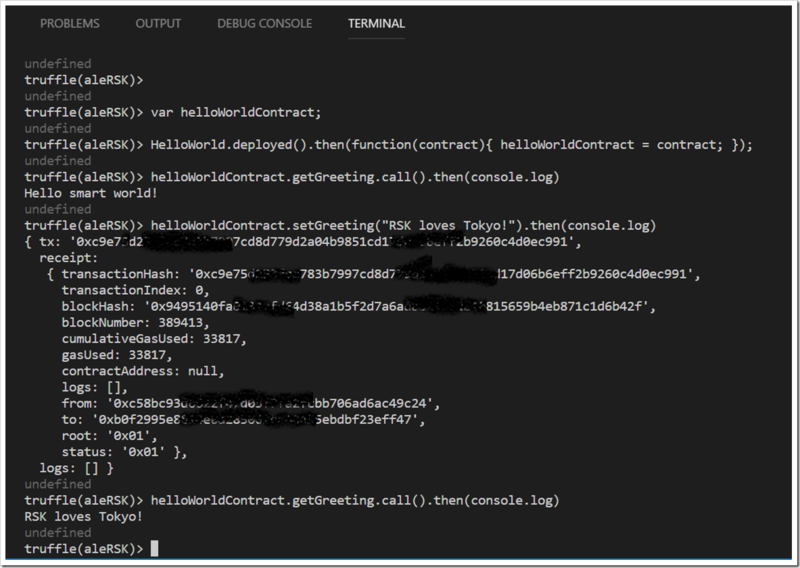 This three lines creates a variable “helloWorldContract”, then reference the Smart Contract to this variable, and finally we use the variable to call the “getGreeting” function in the contract. The result is quite different from the other calls, and the time between the call and answer may vary if you are running local or connected to a remote network. Because we are setting a variable, we need to run the Smart Contract through a transaction to the blockchain. The command result is the transaction receipt. You can see the blockNumber, transactionHash and gasUsed among other info. If you are running this on a remote network (testnet or mainnet), you will find this transaction details in the explorer (see tools section). Now, the last step is calling the “getGreeting” function again to check our new greeting message! As you know, the Smart Contracts deployed to remote networks are executed by the real nodes participating in the network. It’s normal that the transaction have some delay in the execution, and maybe you will see the same first greeting message, give the network some time and run the command again. 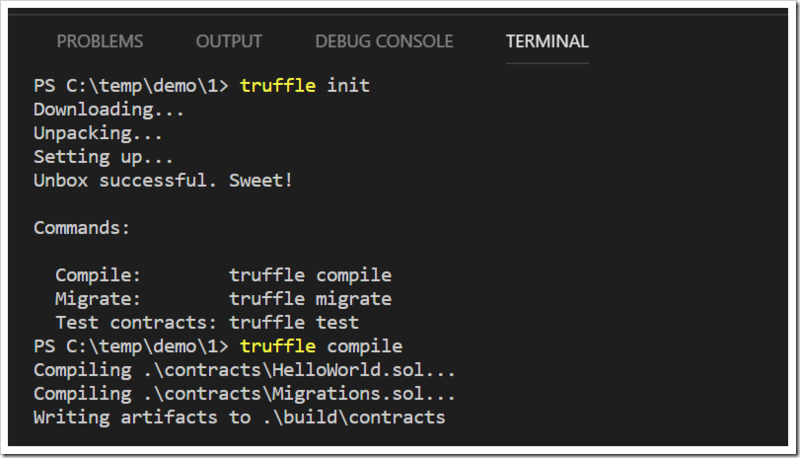 Copy this code to the “truffle.js” configuration file. The last command returns your RSK Address.Copy and paste it on the configuration file (“from” variable). Navigate to the testnet faucet (https://faucet.testnet.rsk.co), and paste your address to get some SBTC. Back in the terminal, press CTRL + C + C to exit the console. 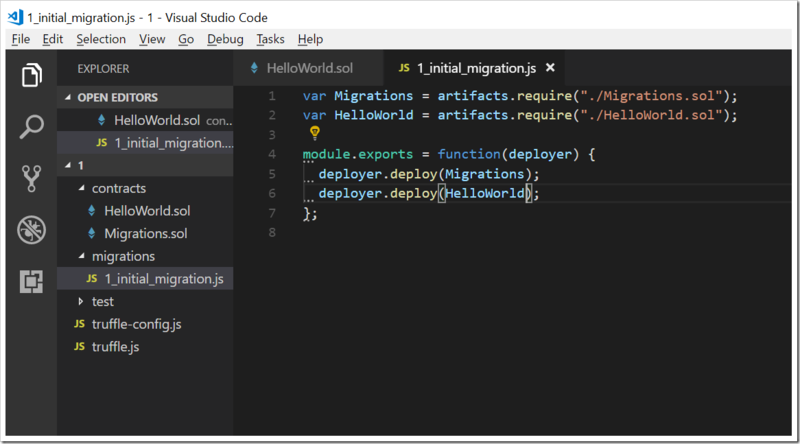 After that, run the migrate command as we learnt in the previous sections. Replace “aleRSK” with the name you want. Be sure its the same configured before in the “truffle.js” file. After that, test it using the same steps as in the “testing your smart contract” section. If you are here you’ve showed passion about the technology. Join our Global Community Slack and join the RSK Ambassador Program! Dumb question, but what exactly can the average Joe make with smart contracts? Also, what are the advantages of using RSK opposed to Ethereum? 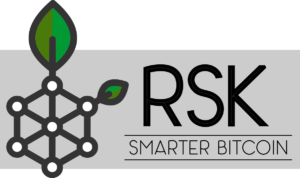 The main advantage is that RSK is pegged to Bitcoin – the longest, most secure and mature open, public blockchain network. Hi there. I am trying to deploy on testnet using the public node and i am not getting nowhere. Not sure if previous comment got posted. I am getting error while trying to connect to local rsk testnet node. viveks-mbp:rsk_tutorial vivekbhandari$ truffle migrate –reset –network aleRSKUsing network ‘aleRSK’.